The Android development community is actively working on bringing Android 4.x Ice Cream Sandwich on as-of-yet unsupported devices and the latest device to get Ice Cream Sandwich unofficially is the Nook Color. We’ve got a step-by-step guide ready after the jump which shows you how you can flash a preview build of CyanogenMod 9 based on Android 4.0.1 Ice Cream Sandwich (ICS) to your Nook Color. News of the tool comes straight from XDA-Developers – a popular forum for Android enthusiasts, developers and modders – in the form of a thread posted by developer dalingrin in which he discusses the state of the ICS ROM for Nook Color and how you can install it on your device. This is a preview release, so it is not stable enough to be used as a daily driver. Do not install this on your Nook Color unless you know what you are doing and know how to bring your device back to life in case anything goes wrong. As of right now, features likes sound, video, hardware acceleration does not work. There are bound to be more non-working features; they’ll be discovered as more people test the ROM. Step 1: Download CyanogenMod 9 ICS ROM [Goo-Inside.me] and transfer it directly under the /sdcard directly on your Nook Color. Step 2: Boot into ClockworkMod Recovery. Take a nandroid backup as you may want to revert back to your current device state in case you find CM9 to be too buggy (which it is). Step 3: Select wipe data / factory reset from the main menu to, well, wipe all data! Step 5: Select reboot system now from main menu. 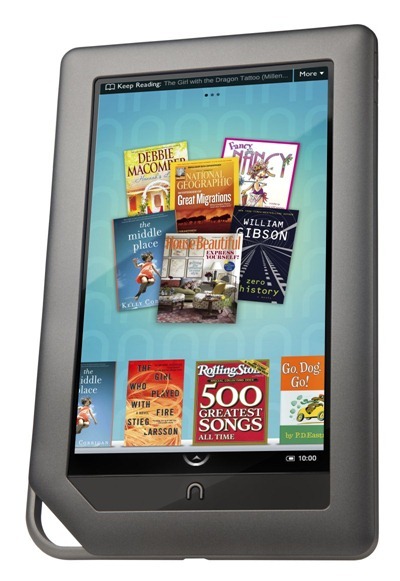 If you followed the steps correctly, your Nook Color will now boot up into a preview version of CyanogenMod 9 based on Android 4.0.1 Ice Cream Sandwich. For queries, check out the official thread on XDA.